What are the advantages of having wet umbrella bag holders and umbrella stands in your facility year-round? No Comments on What are the advantages of having wet umbrella bag holders and umbrella stands in your facility year-round? In recent years, many people have reported changing weather patterns resulting in damage to the environment and to buildings. All business, facility, and property managers for small as well as large operations recognize the risk of dangerous wet and slippery floors as a result. To avoid this serious exposure for injury, wet umbrella bag holders and umbrella stands are practical solutions. They store umbrellas as guests enter a building and they neatly collect water from inclement weather. Keeping floors dry minimizes the need for excessive floor maintenance. Attractive umbrella stands are perfect for coat check rooms, waiting rooms, offices, funeral homes, small retail stores, residential, bellman stations, libraries, showrooms, and any other places where visitors or employees enter. Umbrella stands have the added advantage of allowing visitors to regain the use of both hands while shopping, eating, and while engaging in any activity they choose. They can also be used year-round and they accommodate both tote and full sized umbrellas. Finally, if a facility already has a color scheme and a specific interior design, satin aluminum and tarnish proof satin brass finishes make attractive additions which can elevate a building’s overall décor. 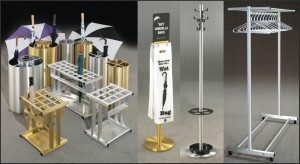 More information about umbrella stands and wet umbrella holders and stands can be found at glaro.com.